Uso para: metodo tradicional. Cafeteira eletrica e cafeteira italiana. (Just for reference, if you give either of us coffee, it’s for both of us. It just is.). So Ryan was given some pre-ground Brazilian coffee for his birthday. We put it in the freezer before we went to the East Coast two weeks ago, and I took it out yesterday to thaw. So this morning, Ryan was asking me where the coffee filters are… We typically use the French press or make espresso-drinks, so for him to be asking where the filters are was kinda odd. Then I remembered the Brazilian coffee. I hopped up to check the grind. Ryan was right, it was definitely too fine for French press, but it almost seemed too fine for a perc. So I suggested that he try making a shot with it. Espresso. He was nervous, but he tried. Besides, we were out of filters anyway. The whole package was in Brazilian… ahem, Portuguese. So trotted over to my brand-spankin’ new hand-me-down 15″ PowerBook G4 and typed in babelfish.altavista.com and lo and behold, Yahoo has acquired Babelfish! It looks the same and works the same, it’s just couched in Yahoo-ness. Use stops: traditional method. Electric coffee pot and Italian coffee pot. What? Use for either? Electric or Italian? A quick Google reveals that in Brazil, they are “traditionally” the same thing. So Ryan made his espresso with our American-Italian coffee maker. A Breville. It was actually pretty good! I’d wimped out and used our decaf whole beans. Hi friends. I’d like just like to remind us all about a little story that I think sheds a little light on life, liberty and the pursuit of cupcakes. I was talking with Heidi today and referenced what I refer to as “The Elephant of Truth” and I thought it might be useful to post this lovely metaphor to remind us all that as flat as a pancake can be, it always has two sides (I love mixing metaphors). 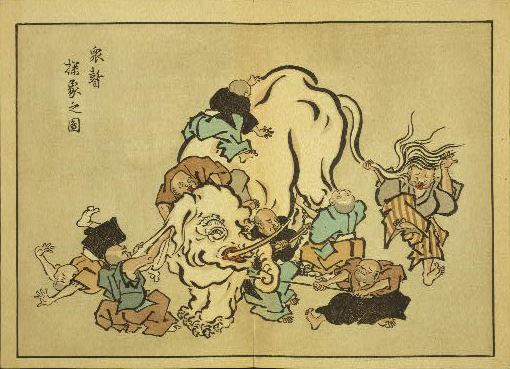 Anyway, the story of the blind men and an elephant has always been a relevant one for me. And although it seems to have originated in Southern Asia, I believe it has relevance for our post-modern pseudo-urban community-deprived culture. I loved LEGOS as a kid… Still do. But here’s something to which Lego Meniac’s can graduate! An educational toy! Thanks to Darren. LA residents use 6 BILLION plastic grocery bags each year and only recycle 5% -the remainder ends up in the ocean and landfills. It costs us 14 cents to collect and dispose of each plastic bag. Check this out! One laptop per child. This is really neat. Starting November 1st, you can spend a measily $400 and get a cool little kiddie laptop for yourself, your puppy or your neighbour’s kid, and the company will send another laptop to a child in some developing country. I think it’s neat. So does my friend Darren. You are currently browsing the archives for the The Whole World category.